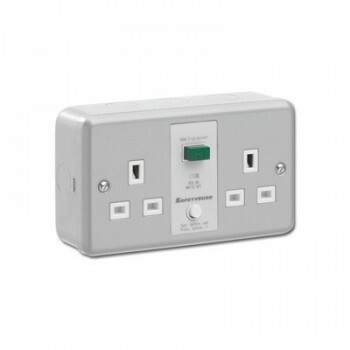 Greenbrook SafetySure Metalclad 2 Gang 13A Unswitched RCD Socket at UK Electrical Supplies. Protect yourself from electrical faults with Greenbrook’s Metalclad 2 Gang 13A Unswitched RCD Socket (M22M), part of the SafetySure range. Residual current devices, like the M22M, monitor the current flowing through their live and neutral wires and, if they detect an imbalance, automatically cut the power in less than 40 milliseconds i.e. before it can cause any damage. Like the rest of the SafetySure range, this durable Metalclad RCD socket fully conforms to British Standards. It also features a mechanical flag trip indicator; handy test and reset buttons; and a one year guarantee for added peace of mind.